Marx and Lenin have taught us that anything is ethical, so long as it is in the interest of the proletarian class and its world revolution. 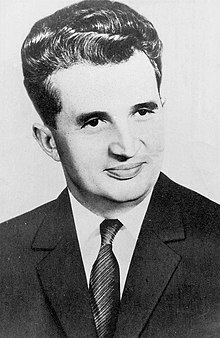 Nicolae Ceaușescu (26 January 1918 – 25 December 1989) was the dictator of the Socialist Republic of Romania from 1967 to 1989. He gained international prominence in 1968 by denouncing the Warsaw Pact invasion of Czechoslovakia. After visits in 1971 to China and North Korea, he pursued a program of rapid construction and development combined with mass propaganda. He responded to the tightening of credit in the 1980s with a severe austerity campaign. Romanians rose up against Ceaușescu in December 1989, and he was overthrown and executed by officials within his government. It is a lie that I made the people starve. A lie, a lie in my face. This shows how little patriotism there is, how many treasonable offenses were committed.… At no point was there such an upswing, so much construction, so much consolidation in the Romanian provinces. I guaranteed that every village has its schools, hospitals and doctors. I have done everything to create a decent and rich life for the people in the country, like in no other country in the world. p. 73 during 1977, said to be "his favorite slogan"
It's expensive to keep Communism alive today. I've already got a huge foreign debt staring me in the face, and I can't reduce it by exporting tomatoes or toilet paper. We should be making dollars any way we can. And we should be exporting arms any way and every way, openly and secretly, legally or by smuggling-I don't care how. Are teaching us to move forward. That we say liberty, truth and steadfastness. With all that is heart in us and in Romania. Our goals are the same, to have a just system of economics and politics, to let the people of the world share in growth, in peace, in personal freedom, and in the benefits to be derived from the proper utilization of natural resources. We believe in enhancing human rights. We believe that we should enhance, as independent nations, the freedom of our own people. Jimmy Carter welcoming Ceaușescu (April 1978). Muravchik, Joshua (February 2007). Our Worst Ex-President. Commentary magazine.. I would like to salute [Ceaușescu's] intransigent patriotism and ferocious will for independence. A veritable amity links me to him. Esteemed chairman of the court, today we have to pass a verdict on the defendants Nicolae Ceaușescu and Elena Ceaușescu who have committed the following offenses: Crimes against the people. They carried out acts that are incompatible with human dignity and social thinking; they acted in a despotic and criminal way; they destroyed the people whose leaders they claimed to be. Because of the crimes they committed against the people, I plead, on behalf of the victims of these two tyrants, for the death sentence for the two defendants. You need not admit your mistakes, mister. In 1947, we assumed power, but under completely different circumstances. In 1947, King Michael showed more dignity than you. And you might perhaps have achieved the understanding of the Romanian people if you had now admitted your guilt. He tells nothing but lies. The new kind of politicians lie all the time. But my father was one of the old kind, more of a fanatic. He was driven by some kind of fanaticism. This belief that you can do good. It's a sort of madness. He was a hard man who really wanted to win, all the time. He wanted to win at chess. It's well known that in chess when you touch a piece, you've got to move it. That's in the rules. But Ceausescu would touch a piece and see that it was a bad move and say, "No, no, wait, wait. I haven't thought long enough." Gheorghiu-Dej put more people in prison, but he had a motive. Ceausescu had no motive to do what he did. Things were worse under the last ten years of Ceausescu. It was terrible what he did. Up to 1971, by Marxist standards, he was able to generate new ideas within the limits of the system. After his visit to China and North Korea in 1971, something of crucial importance must have happened in his mind. What he saw in North Korea was an image of real socialism- that is, total regimentation. Of course, everything was fundamentally wrong from the beginning. But the practical approaches until 1971 were mitigated by a degree of realism and independent thinking which had not yet become militant and destructive nationalism. I think that all his life he believed in what he considered to be the generous idea of socialism and Communism. But in 1971 he apparently discovered the uses of pyramidal organisation inherent in one-party rule. And he discovered the crucial importance of the top of the pyramid. He hated and despised Stalin who had enjoyed just such a position, but Ceausescu hated Stalin because he saw him as the leader of an Evil Empire. The evilness of it was its imperial character, not its ideology. Hence Ceausescu was blind to his own messianic bent. Tito did not like Ceaușescu personally, because when they went hunting wild boars together, Ceaușescu cheated and broke the rules. He once took a shot at a boar, and having missed it, fired at it a second time after the boar had moved out of Ceaușescu's and into Tito's field of fire. Tito then killed the boar with his first shot, but Ceaușescu falsely claimed that he too had hit the boar with his shot. 'In that case, your shot must have gone up the hole under the boar's tail,' said Tito sarcastically. When they went hunting together again a few year later, Ceaușescu again claimed to have killed a boar when it was in fact Tito who had shot it. Nicolae Ceaușescu aveva fama di eretico, ma era diversissimo da Tito. Era il più staliniano dei tiranni comunisti balcanici. Umili origini. In sintonia con le radici della sua terra, l'Oltenia, landa di foreste oscure e di atrocità ottomane. Nicolae Ceaușescu had the fame of a heretic, but he was very different from Tito. He was the most Stalinist of the Balkan Communist tyrants, in tune with the past of his homeland, Oltenia, a land of dark forests and Ottoman atrocities. This page was last edited on 27 January 2019, at 22:14.